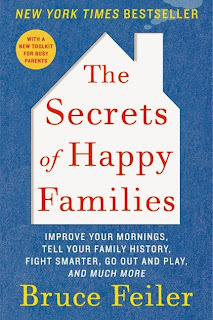 I recently had the chance to read The Secrets of Happy Families, by Bruce Feiler. I wasn't sure what to expect as I began the book, but I must say that Bruce put my fears to rest when in the introduction he stated "A collection like this is liberating, I believe, because it is obvious no one can attend to them all." It took the pressure off...it wasn't a one size fits all set of advice. It was meant to be something where you could pick and choose what worked for you. As I continued to read, I was surprised to see that one of the experts that he consulted with as he searched for the secrets to happy families, was Jim Collins, author of Good to Great. This is a book that I have read and found very insightful. Certainly, Good to Great was written about companies, but a large part of is about creating a great company culture and I totally could see how he would have good perspective on creating a good culture at home as well. It gave me a boost as I read to see that several of his suggestions are things that we already have in place in our household. With everything that pulls you in a hundred directions, it was reassuring to know that we are doing some things right (not that not doing things is wrong - again not one size fits all). My book is all dog-eared with corners flipped down at sections that I want to be able to quickly reference and consider how to implement. Some of the things that he talked about are not things that I expected...things like talking to your kids about sexuality, some of the thoughts being different than I had going in, but after consideration, points that I think are very valid. He also talked about teaching your kids money management; how to keep the family engaged on family vacations, which seem like great ideas when you consider that everyone has varied interests; and organized sports. An interesting statistic that he shared was around the subject of divorce. "Divorce is now at a thirty-year low in America...A primary reason is that people have been getting hitched later. The biggest single risk factor for divorce is getting married before you turn twenty-four; the biggest predictor of marital success is graduating from college." This struck me because a few weeks back, I had gone to dinner with several friends...as we talked, something struck me...most of them had been divorced (many were remarried). As we talked about it, many of them had gotten married young to someone that they knew from high school or college. It struck me at that time how interesting it was that they had all been young. So, when I read this paragraph in the book, it really jumped out at me. I really liked the format and approach of the book. I liked that not only did the author research the topics, but he implemented many of the ideas in his own family to test things out. He shared anecdotal evidence from his experience, as well as from those that he met with to seek guidance and research the topics. If you are looking for an easy to read, low pressure book on happy families, I would check out The Secrets of Happy Families. The book even includes a toolkit to help you implement the ideas that you like. Enter Today | 1/28 - 2/15! What if all the advice you've been hearing from the "experts" on marriage and family is wrong? What makes them experts anyway? Determined to find the smartest solutions and the most cutting-edge research about families, bestselling author and New York Times family columnist Bruce Feiler gathered team-building exercises and problem-solving techniques from the most creative minds---from Silicon Valley to the Green Berets---and tested these ideas with his wife and kids. The result is a lively, funny, thought-provoking and original look at how we can create stronger parent/child relationships, manage the chaos of our lives, teach our kids values and grit, and have more fun together. About the book: The book that revolutionized our view of what makes families happy . . . Determined to find the smartest solutions and the most cutting-edge research about families, bestselling author and New York Times family columnist Bruce Feiler gathered team-building exercises and problem-solving techniques from the most creative minds---from Silicon Valley to the Green Berets---and tested these ideas with his wife and kids. The result is a lively, original look at how we can create stronger parent/child relationships, manage the chaos of our lives, teach our kids values and grit, and have more fun together. Purchase a copy and download the Happy Families Toolkit here.